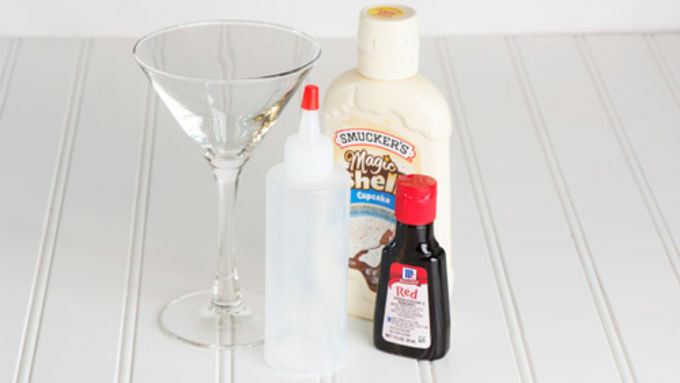 While there are relatively few explicitly holiday-themed cocktails, it's easy to take an old favorite and, through the magic of a delightful garnish, turn it into snazzy holiday fare. Take the old standby, the grasshopper. (We'll do a shaken grasshopper, not the blended version, if only because blending drink after drink for guests will give any host a very non-festive headache.) It's green and minty, so it's already two-thirds of the way to Christmas glory. 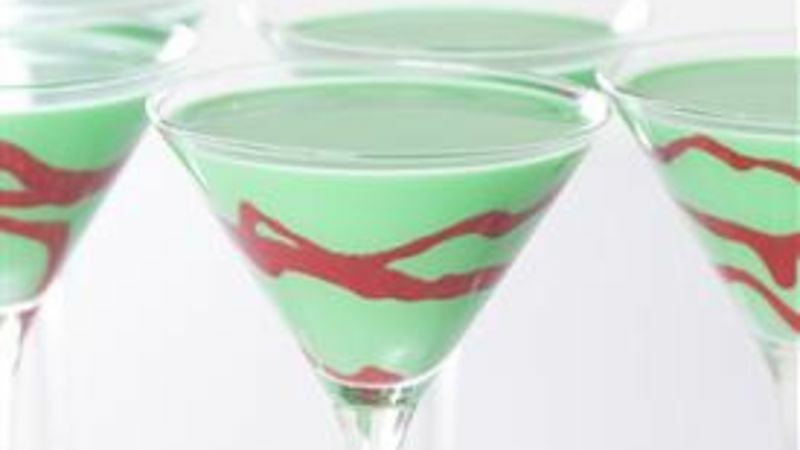 The appropriate garnish takes it over the top, turning a monotone green cocktail into a slammin' Holiday Grasshopper Cocktail. The garnish is indeed magical... or Magic Shell, at least. Yes, your favorite ice cream topping does holidays AND cocktails. Who knew? White Magic Shell (which is actually cupcake-flavored, in this case) is dyed red (add the food coloring slowly, because the magic shell picks up color extraordinarily well, although you do want a deep, vibrant red) and then swirled on the inside of frozen martini glasses, using a cheap plastic squeeze bottle. 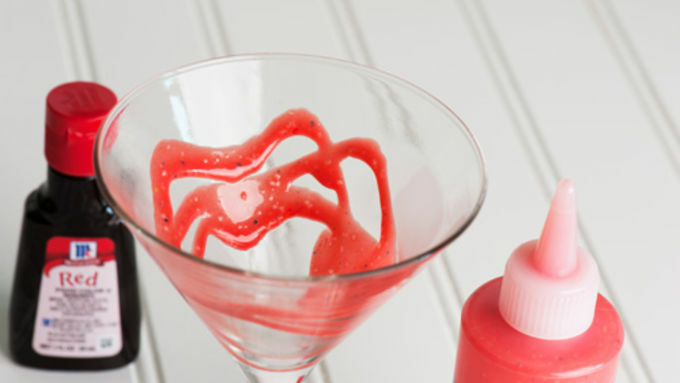 It sets up instantly, leaving bright red contrasting designs that will show up when you pour the grasshopper in. You can do holiday stars, or swirls so the finished drink is reminiscent of Christmas ball ornaments. It's very important to have everything very, very chilled. You will want to mix up your batch of grasshopper cocktail well ahead of time, and keep the pitcher in the fridge. The cocktail glasses can be done ahead of time too – and after you're done garnishing, slide them back in the freezer, as well. As you serve a cocktail, pull the glass out of the freezer to fill it with grasshopper, then return the pitcher to the fridge. Don't try to pour a whole platter of the cocktails at once; by the time you get to the last glass the décor will have softened. They aren't quite as fragile as they might sound, though once the drink is in the glass it keeps the decoration nice and cold. As you sip your grasshopper and graciously accept the compliments piled on by your guests, start thinking of other uses for the colored Magic Shell garnish... (Something pastel?) 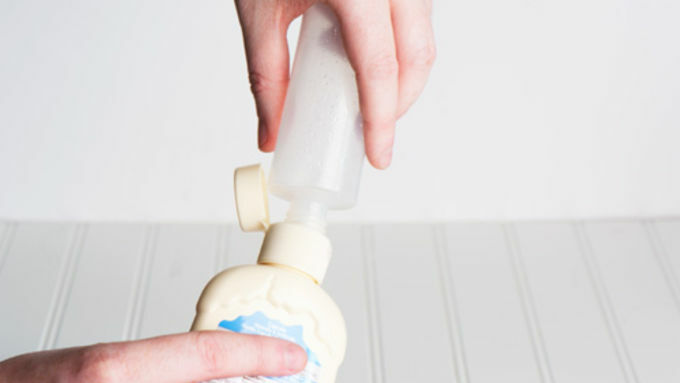 Springtime's right around the corner. 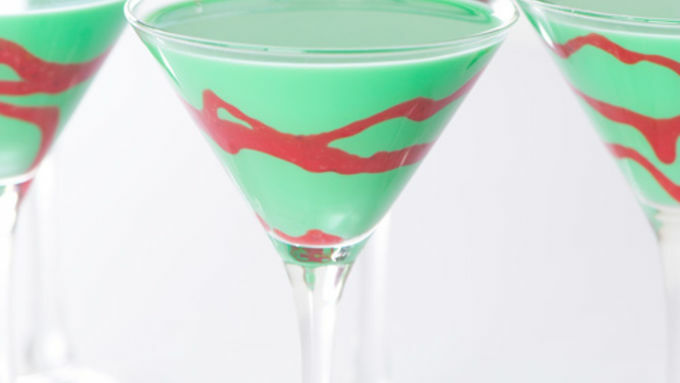 Hope the grasshopper brings a little fun to your next holiday cocktail party!